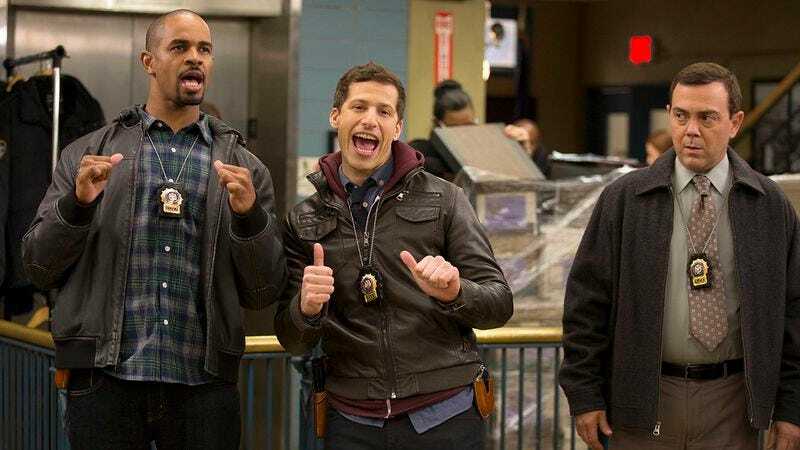 Ensuring that it doesn’t get buried in a fan campaign of mailed-in yogurt cups or old Tandy computers, Fox has announced that it’s renewing critically beloved comedies Brooklyn Nine-Nine and The Last Man On Earth for fourth and third seasons, respectively. Things are a little less clear for Fox’s sitcoms that aren’t led by Saturday Night Live alums, though: Even New Girl, which has transformed over the years from a quirky underdog into the elder stateswoman of the network’s live-action comedy lineup, has yet to pick up a renewal. Deadline says it’s definitely coming, though, and that the network is just waiting for “a few things” (like an expansion to Zooey Deschanel’s funny hat budget, we assume) to get worked out before things get formally announced. Less certain: The fates of Fox’s various freshman comedy series, including John Stamos’ Grandfathered and Rob Lowe’s The Grinder. Having earned considerably higher ratings (if less critical praise) over the last year, Grandfathered is probably coming back, but sources are calling a second season of The Grinder a “long shot.” Which is still better than the odds being offered up for its fellow newcomers, Cooper Barrett’s Guide To Surviving Life and the animated Bordertown, which are probably just plain dead.